Not just one Meson Monasterio photo but four. Meson Monasterio landscape of Tenerife. The Meson Monasterio photo is a rather big image, once you click to enlarge it. It seems to represent a most picturesque village on its own. Everything nests between lush subtropical landscaping. Palms, dragon trees and flowering bushes are the order of the day by the parks front. Later, other trees and plants will astound you. Marvel at the typical Spanish architecture. Spot snow white buildings which are all covered with Spanish tiles. Make out the round and square towers and sash windows. What is not revealed by its Spain traditions are the many chimneys of this oasis. What else makes El Monasterio a must see ? The photos reveal none of the Monasterio's farm animals and orchards. More about that by the last link below. Enchanting meson Monasterio photo details everywhere. In fact, something new and surprising is behind every corner of the Meson Montañeta Realejos Park. It's not unusual to discover a sightseeing hen which strolls about. Then, look out for that turkey and pheasant playing hide and seek by a patio restaurant table. El Monasterio Mansion with Tenerife Christmas. Otherwise, the world is still in harmony at El Meson Monasterio. It enchants Tenerife tourists and locals alike. Admire the outside of its largest Restaurant by that name by enlarging the photo depicted beside. The wide building was captured on camera at a rather interesting, unusual angle. It draws your gaze straight to a central winding staircase. It leads to its first floor, whose balcony is lit up with Christmas lights. Eat a delicious dinner on its porch and admire the evening views! A gay hint of two towers with iron bells in it are above the big edifice. A well is partly hidden. 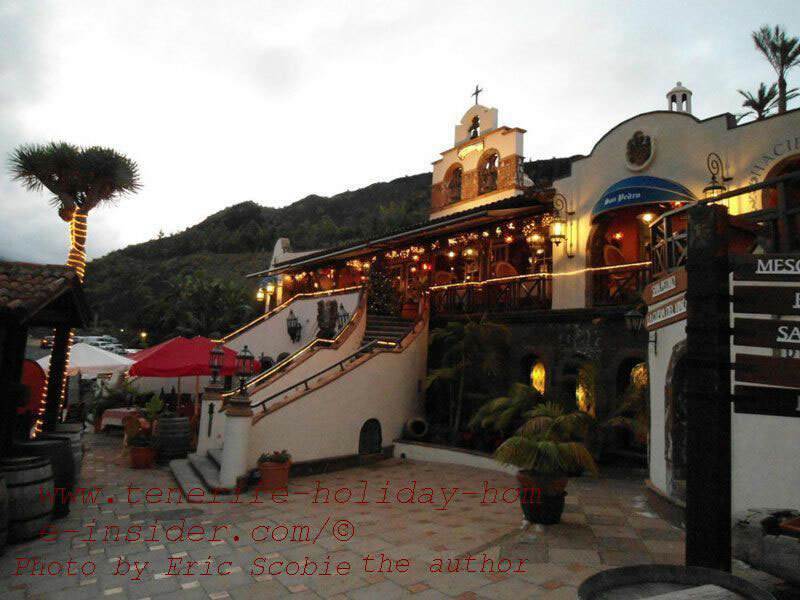 This Tenerife restaurant amusement park which is portrayed by the Meson Monasterio photo received an award of excellency by Trip Advisor in 2012. Tenerife Christmas at Los Realejos by the monk's mountain La Montañeta. Obviously, this is another Meson Monasterio photo. It's named Tenerife Christmas which is a must to click to enlarge. Not just to enjoy its full splendor but, also to see what's where within the mansion by the monk's mountain. For example, there is Restaurant Hacienda San Pedro on the bottom right besides the first floor eating place. This Hacienda restaurant also hides a basement tavern with wooden wine barrels below its street level restaurant. The underground Bodega was installed in a genuine cave, almost 500 years ago. It's famous for its live folk music and happy socializing. Why was el Meson Monasterio so little known to Brits in the past? There must have been a lack of Internet information in English. Germans knew much about the place by word of mouth, mainly. 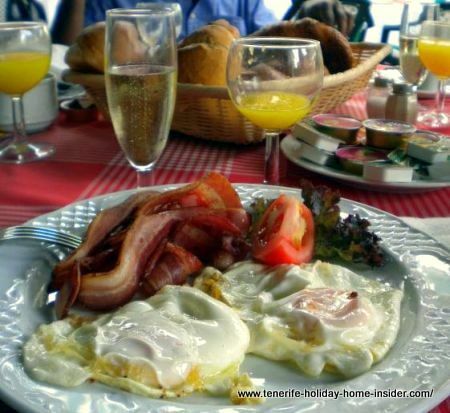 Monasterio champagne breakfast brunch picture. They declared it the best place for Sunday champagne brunches by Puerto de la Cruz, a long time ago. 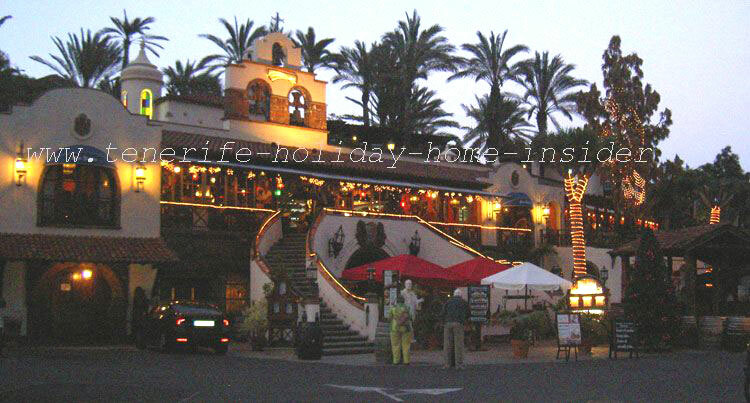 Neat Tenerife place to retire to, less than 10 minutes by car from the monk's Montañeta enclave. From Meson Monasterio photo back to Tenerife culture of this Realejos Park with many pictures and information.